ZipHearing offers discount hearing aids and local hearing care. Seasoned hearing aid buyers seem to be easy converts to the company’s online-plus-local approach. And if you are new to hearing aids, you’ll appreciate the ZipHearing website, with questions and answers and tools to help you become a smarter hearing aid shopper. ZipHearing offers discounts on multiple hearing aids, personal hearing aid fitting and adjustments and a 45-day trial period. If you're in the market for a hearing aid, check out their website for pricing and how to get fitted. When you buy a hearing aid, you can go about it two different ways. You can go directly to a hearing aid company, shop at a location and purchase hearing aids directly, or you can shop online through a third-party network that may offer a more extensive selection of hearing aids as well as potential discounts. Founded in 2012, the San Diego-based ZipHearing combines a shopping site able to offer steep discounts in price, with an extensive network of more than 700 local hearing specialists across the U.S. who can help you with style, fit and functionality. If buying a hearing aid online sounds difficult, it can be. The ZipHearing purchasing process works a little differently, starting with a toll-free call. A company specialist then connects you to a local auditory service provider, and if you contact that provider to schedule a consultation, you qualify for discounted pricing and specials. From the positive reviews the company gets from customers, the discounts can be substantial and the service provider network quality is top-notch. ZipHearing bills itself as a place where hearing specialists and internet pros merge. Not only is their site well designed, but it’s also an informative, comprehensive resource to help anyone new to hearing aids. Once you know what you’re looking for, the ZipHearing website serves as a handy place to compare popular hearing aid models and prices. As our expert explained in our Hearing Aid Buyer’s Guide, the average cost of one hearing aid is $2,300, and nearly $5,000 if you need hearing aids for both ears. ZipHearing’s transparency while showing the full and discounted prices allows you to compare the cost of a variety of hearing aids to find what works for your budget. That makes ZipHearing a brand to consider before you buy your first — or your next — hearing aid. The company offers an array of products at different price points ranging between $1,000 to $3,000. Prices are not listed online for all brands. Some require a phone call to get a quote. To get a sense of the discounts offered by ZipHearing, we pulled together a sampling of hearing aid brands and styles to compare pricing. The warranties on these models run from one to three years. The service provided by ZipHearing starts on the company’s website and its Buying a Hearing Aid online guide, which walks you through the buying process in simple, consumer-friendly terms. Included are tips for determining your level of hearing loss, defined as mild, moderate, severe or profound. Based on your answer to this question, the site answer automatically starts narrowing your choices. Next, you define your lifestyle. For example, if you are outdoors or around a lot of people all day, your hearing aid will need to be more sophisticated than if you live alone and spend a good deal of time indoors. The Buying a Hearing Aid guide can also help hearing aid shoppers understand different styles, as well as added features, such as waterproofing, push-button controls, wireless capability, a connected app and more. Never heard of features like tinnitus therapy and telecoil? The website explains all features in an easy-to-understand way. Consumers who are ready to take the next step call a ZipHearing specialist to find a local provider in the company’s network. 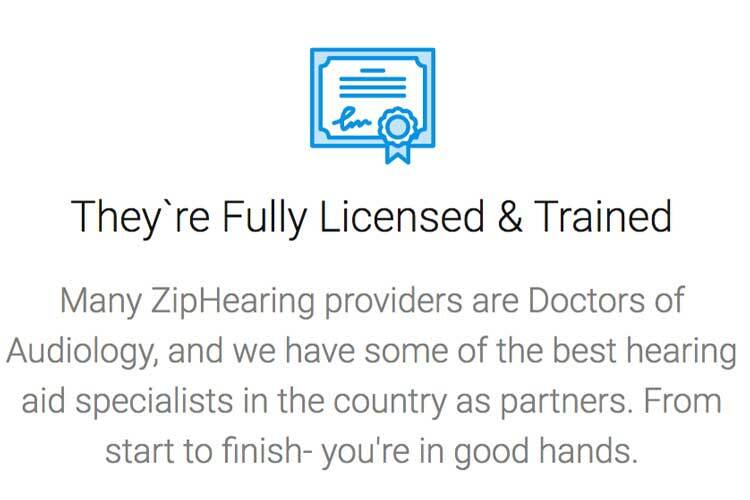 All providers in the ZipHearing network are trained, licensed audiologists or hearing aid specialists. These are the experts who test your hearing and make the diagnosis, help with the fit and functionality of the hearing aid, and provide check-ups and repairs when needed. The relationship with this local specialist is vital because hearing aids always need regular maintenance and care. Included in ZipHearing’s service are unlimited visits to the hearing specialist during the initial 45-day trial period, and three more visits for the next year after. Service prices do not include hearing tests, but many of the providers conduct hearing tests free of charge. Personal hearing aid fitting and adjustments A local, licensed specialist in the ZipHearing network conducts a hearing test, helps you adjust your new hearing aid and get the fit right. 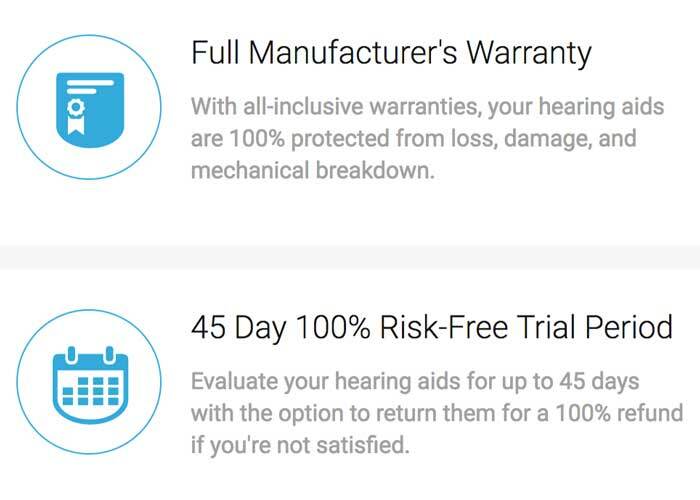 Full manufacturer warranty All of the product manufacturers working with ZipHearing offer comprehensive warranties varying from one to four years and cover loss, damage and mechanical failure. 45-day trial period After your hearing aid fitting, you can try them out for 45 days with free appointments with your local specialist. Within this period, you can return the hearing aids for a full refund. Follow-up care After your evaluation period, you get up to three follow-up appointments with your local provider during the first year. After that, visits are between $35-$65, depending on the length of the visit. One-year supply of batteries ZipHearing will deliver a one-year supply of Rayovac hearing aid batteries. ZipHearing carries products from brands including Phonak, Unitron, Starkey, Resound and more. These brand names are built by the biggest name-brand manufacturers in the world, with the best resources dedicated to research and innovation and most likely to distribute their hearing aids nationwide. They are also the companies that are most likely to be recommended by patients and physicians. ZipHearing pays attention to what consumers are saying about hearing aids and the manufacturers that make them, and those real-world reviews impact the devices the company offers. Among manufacturers with multiple devices on the market, ZipHearing claims to offer the newest models and latest technology. The ZipHearing website has a lot to offer hearing aid shoppers and new hearing aid shoppers in particular. The site allows you to browse different product types, get a sense of the available features and functionality without a heavy sales pitch. ZipHearing carries an A+ rating with the Better Business Bureau, with five out of five stars based on 34 positive customer reviews, and zero neutral or negative reviews. Online customer reviews have little to no problems to report, and most ZipHearing customers say they saved $1,000 or more. Both longtime hearing aid users and first-timers finding the right hearing aid fit talk about the ease of ZipHearing’s process, the excellent customer service, top-notch local auditory specialists and, as mentioned, the tremendous value. Does it make sense to buy hearing aids online? If you are a first-time shopper, buying hearing aids online can be risky unless you go with a company that offers a local service provider as part of the price. Some companies will claim that they can remotely program hearing aids you purchased online, but this is often a frustrating experience, especially for first-time buyers. How do I compare discount hearing aid sites? When shopping online vendors, it helps to pay attention to what the price includes. Ask these questions and seek out sites that are authorized retailers of the hearing aid brands they sell. How many service appointments would I get? Are there fees for returning hearing aids? What extra features does the hearing aid offer? Is ZipHearing an authorized retailer of the hearing aids it sells? Yes. As an authorized retailer, ZipHearing products are backed by warranties from the hearing aid manufacturers. It’s important to seek out authorized retailers when shopping for hearing aids online. Unauthorized online retailers may sell products with warranties, but consumers later find that the warranties are not honored when the hearing aid malfunctions. Many service providers will refuse to work on hearing aids from unauthorized channels, and there is even a chance that an unauthorized hearing aid could be confiscated. Will ZipHearing ship hearing aids directly to me? No, ZipHearing ships the hearing aids to the local service provider, who can help you with fit and adjustments. A retailer that ships hearing aids directly to consumers is most likely not an authorized retailer. What do ZipHearing’s prices include? Included in the price of your hearing aids is the local service. ZipHearing will refer you to a local provider. You call and book a consultation with that provider and, if you decide to buy hearing aids after that consultation, the provider will order them from ZipHearing at a discounted rate. Then ZipHearing calls you for payment and ships the hearing aids to the provider. Unlimited visits to the local provider are free of charge for the first 45 days, and three additional appointments are free for the next year after that. Is the first provider visit free? There is no charge for the first consultation visit at a provider’s office. However, ZipHearing’s price does not include hearing tests. Many providers will do the test for free, but others may charge anywhere from $25 to $99 for a hearing test. It makes sense to ask the provider upfront whether there will be a charge. Also, check with your health insurance, which may cover all or part of the cost of a hearing test. Does ZipHearing take health insurance? While most health insurers offer little to no coverage for hearing aids, some health plans and Medicare Advantage plans may reimburse you directly for the cost you pay to a hearing aid provider. If your insurer offers reimbursement for hearing aids costs, ZipHearing will file a claim on your behalf. Even if your insurance plan covers some portion of hearing aids, it makes sense to compare your out of pocket costs. Does ZipHearing have any finance offers? The company accepts CareCredit financing, through which you can get deals like 12 months interest-free or up to 48 months at an annual percentage rate of 14.9 percent. You can also use a credit card to pay over the telephone. Are ZipHearing service providers licensed professionals? All ZipHearing providers are licensed and trained audiologists or hearing instrument specialists. You will receive assistance from a ZipHearing provider at all points of the buying process. You will also be taken care of after the sale with maintenance and repairs. Do I need custom ear molds for behind-the-ear hearing aids? Probably not. According to ZipHearing, the majority of hearing aid wearers don’t need a custom ear mold, and so it is not listed in the service price. However, if you do need them, ZipHearing will include ear molds in your order for an additional $100. You can also purchase them directly from the provider. If cost is a top concern, ZipHearing offers discounted options to fit any budget. If you are worried about getting the right fit, ZipHearing provides you with 45 days of free visits to a specialist to get it right, with a few follow-up visits if you need adjustments over time. Even if you decide against using ZipHearing, the company’s website is a great place for first-time buyers to get a sense of what’s available without having the pressure of a sales pitch. That makes ZipHearing a highly recommended company, especially for new hearing aid buyers. I had a problem not with Zip but the local hearing aid company near me. I think that a bad recommendation for my hearing loss was done from the start. Try as they might at this local hearing aid shop to make the hearing aid work for me - it did not. Zip can only provide what the hearing specialist determines will work for you. You must be satisfied that the aid will help you in your life. Do not keep a hearing aid if you are not satisfied with it. My wife had a much better experience with this hearing aid dealer and Zip provided her hearing aide.